See what happens when the local kids are in charge of stalls and entertainment! There will also be a pop up cafe and snacks fundraiser. BYO coffee mugs. 8-year old Travis has big plans: He wants to sell his toys to be reused by others and encourage other kids to do the same. TradeMe was one option, but setting up a kids market in the local neighbourhood was an even better option, according to Travis' mum Terri. With the support of the Green Bay Community House and the local community, Travis and Terri are putting together a community event from Kids, for Kids. 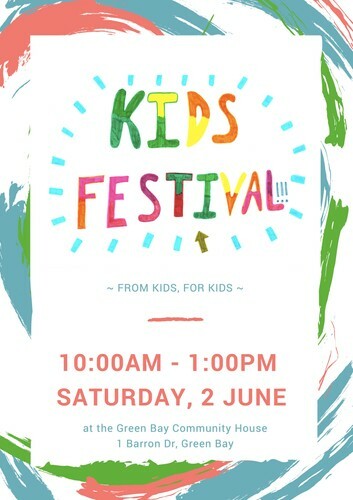 The goal of the Kids Festival is for kids to be actively involved in organising and running their own stalls and activities in a supportive environment in their community. There will also be a pop up cafe as a fundraiser for a local organisation. Please BYO Coffee Mugs for your freshly made Flat White, Cappuccino, Latte, Mocca, Hot Chocolate.